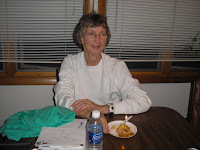 Today would have been my mother-in-law’s 77th birthday. Our kids called her “Grandma Margaret” and she left us in December of 2006. She was someone who devoted her life to her kids and grandkids. She raised 4 children with her husband Bill who died 10 years ago and raised them well. I am grateful to how she raised her son Pat whom I have been happily married to for 10 years. He is still very close to his siblings and all the grandkids are also very close. Margaret was a beautiful woman and our kids frequently talk about her and express how much they miss her. I just wish she could have been around to watch them grow. She would have been so proud! This photo was at the last birthday we celebrated with her. I remember I made her homemade peach pie.